For the last one week, the monsoon build-up has shown no progress. In fact, it may have reversed to some extent. The reason: A passing W.D. causes some drop in temperatures in the Indian Sub-Continent. The IMD deviation map of the day temperatures on 25th. for India shows a region in the U.P. and Punjab region in the "below normal" colours. Otherwise too, the entire country is now in the "normal to +1c region". Indicates the complete abating of the heat wave of the last 15 days. Another important factor which has halted the monsoon development progess are the night temperatures going downwards The map of the minimum temperatures shows a vast area in central/western India in the "below normal" colours. But this effect will reverse soon, and by early next week, heat wave , or above normal conditions will prevail over north-west India, and will susequently spread eastwards. The seasonal monsoon low over the Thar desert, with its centre at Bikaner, has not yet formed. Normally, by this date, end April, we see a low of 1006 mb forming. But the prevailing pressure today over the concerned region is 1010 mb. The "hesitation" in the sub-continent region, has prevented the winds in the southern continent from gaining speed, and slowed their preparedness to cross the equator. The ITCZ still hovers in the 10S line. But, as the streamline map shows, northerly winds are down the Arabian Sea, and re-curving into southerly winds after going around the tip of India. This indicates the presence of a trough in the southern peninsula. 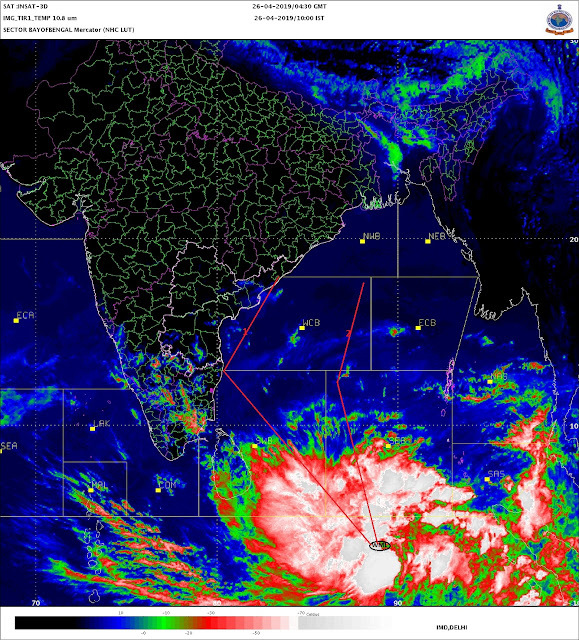 As a result, some rain in Kerala, southern T.N. and southern Karnatak can be expected during the next 2 days, and coastal Kerala may get a burst of heavy rain in next couple of days. But, I am just elaborating the actual situation and observations of last week. The monsoon progress and development, can still catch with the time schedule with the right conditions next week, and monsoon can still be on time. The NCDC also determined that March snow cover extent was near the 1967-2009 average in North America, but below average over Europe and Asia. The snow cover over Europe and Asia in March, is one of the parameters to forecast and calculate the quantum of monsoon rains in India. An interesting fact On the Global scene. 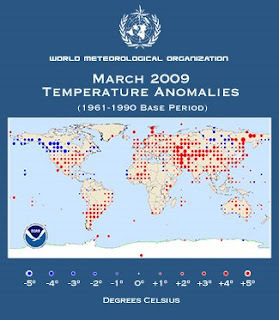 Despite what seems to have been a winter that wouldn’t end across many parts of North America, March 2009 has turned out to be the 10th warmest March worldwide since records began in 1880. .
Land areas of the southern hemisphere experienced their fourth warmest March on record while the dry surfaces north of the equator experienced the 12th warmest March on record. See graphic illustration. Arctic sea ice coverage was at its sixth lowest March extent since satellite records began in 1979, according to the National Snow and Ice Data Center. Antarctic sea ice extent in March was at its fourth-greatest level of the 31-year observational record. Antarctic sea ice extent reached 15.8 percent above its 1979-2000 average. Since 1979, Antarctic sea ice extent for March has increased at an average rate of 4.7 percent per decade.